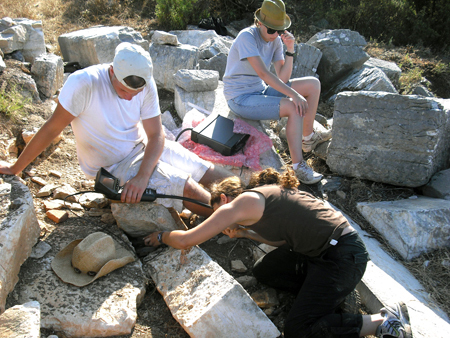 The fourth season of archaeological investigation of the Northeast Temple at ancient Antiochia ad Cragum (Güney Köyü, Gazipa?a) was carried out between July and August 2009. 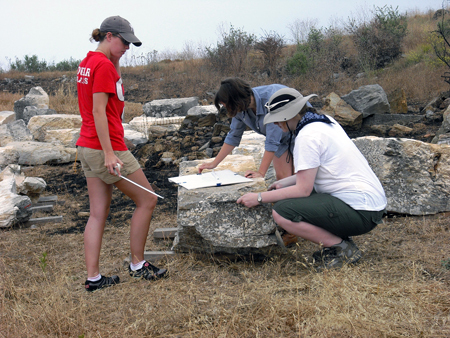 In the seven-week season members of the Antiochia ad Cragum Archaeological Research Project (ACARP) conducted investigations in three interrelated spheres of operation: architectural block recording and removal, remote sensing, and excavation. As in previous seasons project members continued the operation of clearing the western and southern quadrants of the collapsed temple of its scattered blocks begun in previous seasons. The procedure for documentation and removal, developed and refined over the previous three seasons, has proved to be an effective and efficient method. First, each newly revealed and undocumented block is cataloged into a registry system, followed by recording its position by means of a total station into the ground plan of the block scatter. Included within the block registry is a brief description of the block, measurements, preliminary condition report, and a sketch of its position in situ relative to other blocks. Preliminary investigation of each block concludes with a photographic record of its original position. Following this initial autopsy teams of two draftspeople—one person on each team measuring, the second person drawing— photograph and draw one side of the block at a 1:10 scale while the block remains in situ. One side only is drawn in the field since it is often the case that only one side is fully exposed prior to removal. The block is then removed and placed in the block field with the side of the block that has already been drawn placed face down. In this manner the drafting team has convenient access to the remaining, undrawn sides (Fig. 1). 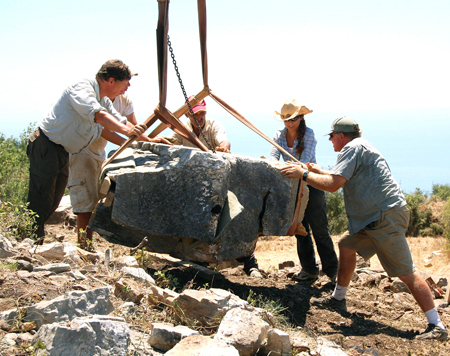 The block is then readied by removal by an operational team, specially trained to prepare and lift the recorded block off the mound. The process of moving the blocks from the mound and to the block fields is a careful and extremely meticulous operation. The team is composed of experienced personnel, with three seasons of work now completed. Included in the team is the crane operator, O. Ça?lar, who has become adept at the careful lifting of ancient blocks. Considerable care is given towards protecting the corners, surfaces and especially moldings during the lifting and removal process. Soft, wooden planks as well as thick carpet pieces are placed between the fabric cables and block surfaces to alleviate stress to the marble during lifting (Fig. 2). Blocks are then transported to the block fields, located adjacent to the temple; as of the end of the 2009 season three block fields are in use. Great experience has also been gained in turning the blocks expeditiously so that the one drawn side of each block is placed on the bottom. Blocks are placed upon wooden skids in the block fields so that they are raised slightly to allow lifting cables easy access when the need arises for the block to be lifted anew. After three seasons of activity upon the temple mound, 546 blocks—partial or complete—have been documented and catalogued, representing an increase of 106 blocks from the 2008 season. Of this number, 434 blocks have been successfully removed from the temple mound and placed in the block fields. In 2009 alone, 209 blocks were transported, demonstrating greater efficiency over previous seasons. By the end of the season the drawing teams had completed by 223 separate drawings. Three sides of the temple are now clear (Fig. 3)—back, west flank, and front—leaving only the east flank still to be addressed; this will be the object of attention in the 2010 season. In 2008, team members utilized Ground Penetrating Radar (GPR) technology (see ANMED 7  9-10) to scan the temple mound for a suspected sub-grade vaulted chamber. In order to achieve a base-line scan of a similar temple platform with vaulted chamber, team members conducted GPR scans of the ‘?ekerhane Kö?kü’, the presumed temple/cenotaph to Trajan at nearby Selinus (Gazipa?a). Scans of the Antioch temple were taken after all the fallen architectural blocks were removed from atop the podium and the area had been levelled in order to achieve an optimum surface for scanning. 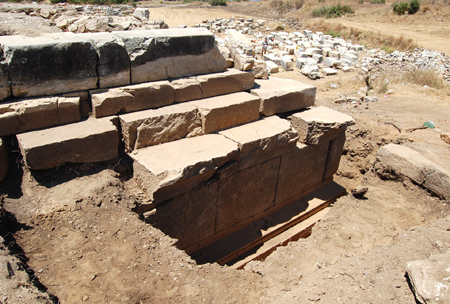 Results from the 2008 scans of the Antioch temple showed likely correlations with the baseline data from the Selinus temple, strongly suggesting that a sub-grade vault does in fact exist at Antioch. In 2009 excavations of the deposits within the podium allowed for additional GPR scans, and it was hoped that with the removal of more than a half-meter of fill from the podium floor might produce a clearer scan of the sub-grade vault. The excavation trenches, however, restricted the mobility of the GPR scanner and thus did not allow for optimal scanning. Nevertheless the 2009 scans continue to indicate the presence of a vaulted sub-chamber. An additional technology was also brought to bear in the examination of the podium this past season. Fiberscopic Remote Inspection equipment, utilizing a boroscope, was used to investigate clues to the original structural and architectural design of the temple as well as its current condition. The boroscope consists of a miniature camera and light mounted at the end of a flexible cable that could be inserted into small crevices or in between blocks for inspection. It was hoped that these crevices within the structure might allow for non-invasive boroscopic inspection of the sub-grade chamber. Several cavities were investigated in this manner (Fig. 4). Unfortunately, none allowed for deep probing. We anticipate that applications of GPR scanning and boroscopic probing will continue in the 2010 field season. Excavations were carried out on the temple mound for the first time in 2009. Within the northern half of the interior of the cella atop the podium, two small trenches (001 and 002), both approximately 4 m by 2m in size, were laid out (fig. 5); the southern portion will be explored in the 2010 season. Another trench (003) was opened at the rear of the temple, abutting on the exterior of the western portion of the back wall. Within Trench 001 a long wall, running parallel to the cella wall along the eastern side of the podium was uncovered. Incorporated into this wall were architectural spolia, such as a frieze fragment, and a decorated columnar drum fragment (Fig. 6). Pottery found within the context of the wall, including examples of glazed sherds, indicates a Byzantine date. This wall was laid directly atop the temple’s cella floor that was revealed at the bottom of the trench. The frieze fragment may belong to the aedicular pediment (AT 119) that is believed to have been incorporated into the rear wall of the temple (see ANMED 7  8). Within the Byzantine wall and the northern and eastern walls of the cella is a layer, approximately 0.30 m deep, consisting of large head-sized stones that may have formed a rough podium along this flank. 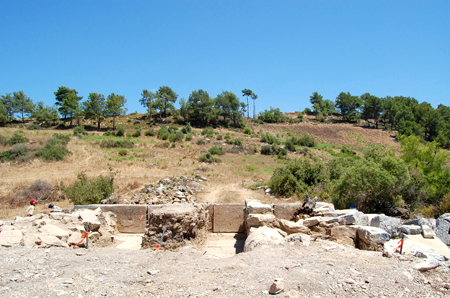 Additional excavation in 2010 should clarify the situation. The fill within Trench 002 revealed little information concerning post-antique usage of the structure. 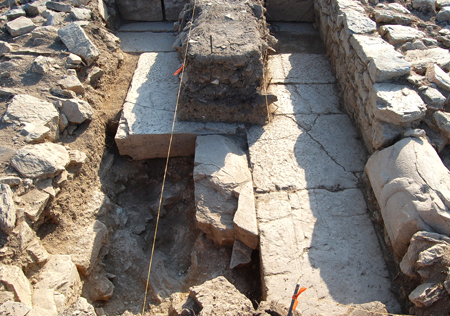 At the bottom of the trench were fragments of the thick marble floor of the cella interior; although some of the floor slabs had been removed, this was clearly the same as revealed in Trench 001. Careful cleaning of the rubble and mortar that serves as the underpinning of the missing slabs indicates that the sub-structure remains intact and has not been penetrated by those who removed the floor slabs. Originally we had feared that looters had entered the vault under the temple floor at this location, but this is now proven unfounded. There is yet no indication of an internal staircase from within the temple interior to the vault below as seen in the Selinus temple. Entry into the vault is now believed to be located along either the temple’s eastern or western flank. The purpose of Trench 003 was to probe the exterior rear façade of the temple; only the western side of the flank was exposed in 2009. Over the centuries, large quantities of soil, washing down from the hillside to the north, have welled up around the temple. This deep layer of fill had accumulated nearly up to the level of the first wall course of the cella that remains in situ along the temple’s rear flank. Over 2.5 meters of deposited fill were recorded at the end of the season. Excavation through this accumulated fill revealed no discernable stratigraphy. Excavation of Trench 003 halted for the season at the level of the first architectural course below the base moulding that may represent the upper part of the structure’s foundations. In 2010 we intend to widen Trench 003 outwards away from the architecture in order to allow for deeper excavation of the trench and also excavate the eastern segment of the temple rear wall. 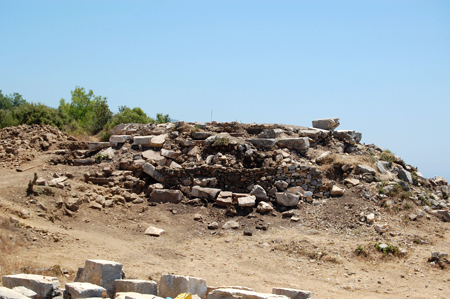 The exterior of the podium at the rear of the temple, as revealed during excavation, is fairly well preserved as a result of the accumulated fill (Fig. 7). Below this wall’s lowest course—preserved in situ—are the podium floor slabs which on the exterior form part of a two-step crepidoma. Below these steps is the podium whose height, although not yet completely excavated, measures preliminarily 1.975 m high. The lowest course of the podium revealed in Trench 003 is currently only partially exposed; it may in fact not be part of the podium proper but belong instead to the foundations. Continued excavation in the 2010 season will reveal the exact nature of the sub-podium situation. The architecture of the podium consists of a base moulding, 0.42 m high, that supports a large orthostate course, 0.89 m in height. The podium’s crown moulding echoes the base’s dimensions at 0.405 m in height. The temple’s crepidoma is recessed from the outer edge of the podium’s crown moulding by 0.68 m. The ornamentation of the architectural elements of the temple’s rear side, now partially revealed, corresponds to the high quality decoration of the building’s superstructure.